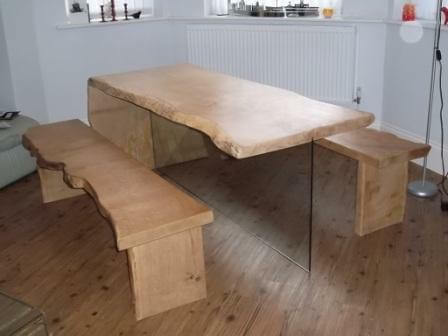 A single slab of 10mm toughen glass running the entire length of the oak dining table which is over 6ft in lengh, as you can see from the picture the table seems to float in mid air. We are confident enough to say that we can support any slab dining table on glass in the same way. The two benches we also cut from the same slab which was at least 300 years old. 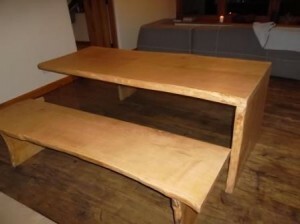 As all the grain matches these sturdy but simple oak benches, compliment the floating glass table beautifully. WOW !! these are super. I love the simplicity of the bench and table design. More pictures please! !